Improving things in IT administration is usually not about changing what things you do. It’s about changing how you do those things. Most of the time all performed operations are pretty basic from a technical prospective (e.g. 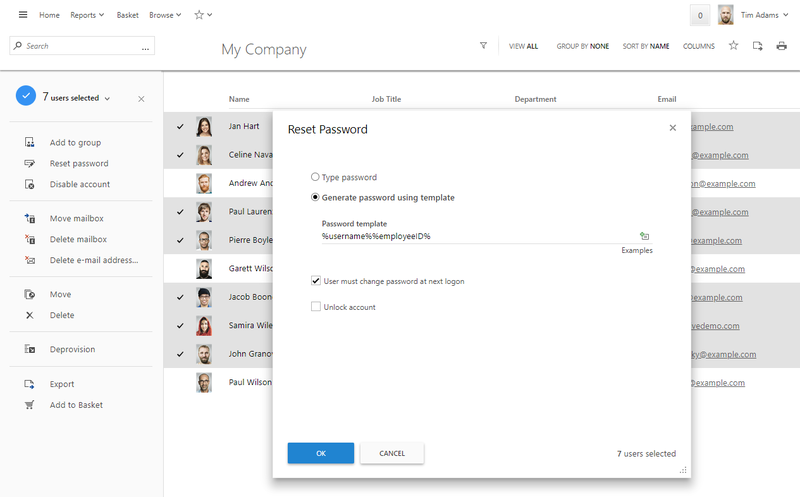 creating user accounts, adding users to groups, assigning O365 licenses, etc. ), so improving the overall workflow really comes down to reducing mistakes and increasing efficiency of the whole process, not to the operations themselves. One of the obvious ways of doing that is executing various routine AD operations in bulk. This can significantly save costs for any IT department and free some valuable time from exhausting routine for doing proper work that IT specialist really deserve. Adaxes overcomes a lot of restrictions that are present in native AD tools. It allows to perform a lot of multiple operations at a time and therefore gets the job done quickly and easily. To execute operations in bulk, the first thing you need to be able to do, is to choose a scope, i.e. actual objects that you will be working with. As Adaxes features multi-domain management, this means that you can get a unified experience for all your managed environment. For example, if you need to find all users from the Sales department, just perform a simple search and you’ll get all of them irrespective of the domain they are in. For even more management convenience Adaxes features virtual collections called Business Units. It’s a way to combine AD objects based on custom membership criteria, without actually moving them in Active Directory. All objects can be members of any number of Business Units. Adding up to the previous example, you can put all members of Sales department in a single Business Unit regardless of their actual location in AD (they can be in different OUs, domains or even forests). Such approach simplifies collective management by letting you have multiple ways of arranging objects without actually changing anything in AD. One of the most common scenarios when bulk operations can apply is during account provisioning. 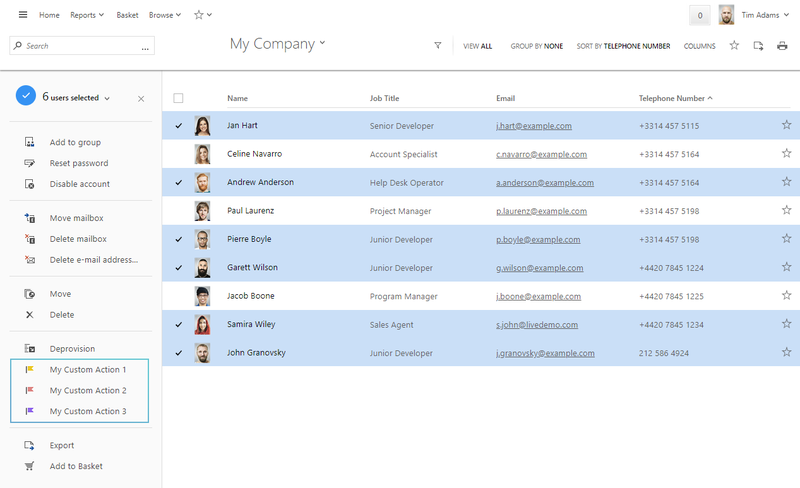 Often HR systems provide new users’ data in a form of A CSV file. Adaxes allows you to import those accounts in one single operation. In comparison to a PowerShell command that might do the same thing, Adaxes can transform such an action into a straightforward and user-friendly task. This means that no knowledge of scripting languages is required and thus such tasks can be delegated to users with no specific IT skills. Going even further, importing new accounts from CSV can be scheduled. For more information about it read the Import User Accounts from a CSV File tutorial. If you have any automation rules associated with user creation, all of them will be applied to newly imported ones. So if you do have any provisioning procedures, e.g. adding new users to groups based on various parameters or assigning Office 365 licenses — all that will be executed automatically for each newly created user. Another common scenario of bulk Active Directory operations is modifying multiple AD properties in one go. This can be partially accomplished using native tools, however, Adaxes brings some significant advantages. 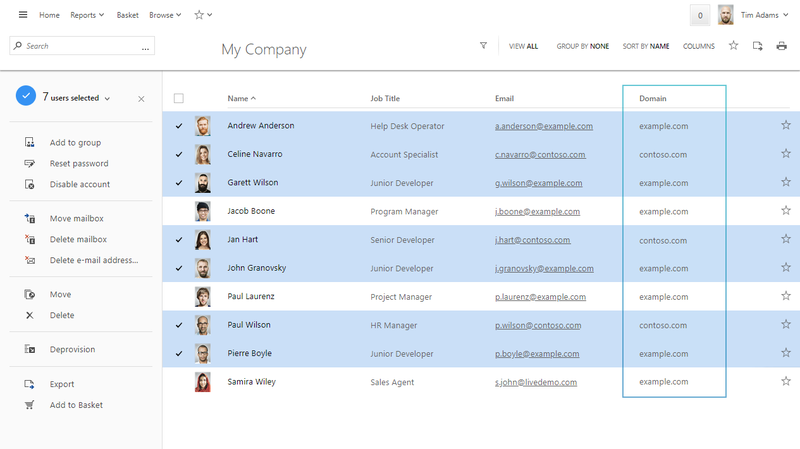 Adaxes allows you to use templates to perform dynamic changes based on existing values for each object. E.g. if you want to change the display name convention for a certain group of users, just select them and apply a new template. Despite the fact that Adaxes provides Self-Password reset functionality, sometimes admin intervention is still required. For example, if a security breach occurs and a password reset is needed for a group of users that might be vulnerable to an attack. With Adaxes resetting passwords for multiple users is really a one-click action. Apart from the standard resetting process, new passwords can include templates that would grab data from already existing user attributes. Adaxes does not limit bulk operations execution to Active Directory only. They also apply to all connected environments such as Exchange or Office 365. For example, Exchange mailboxes can be moved or Office 365 licenses can be assigned to multiple users — all that in one go. It is also worth noting that all that can be operated from Adaxes Web Interface, so there is no need to constantly change consoles. If your IT department does require something more specific that just standard scenarios, you are still good to go with Adaxes. 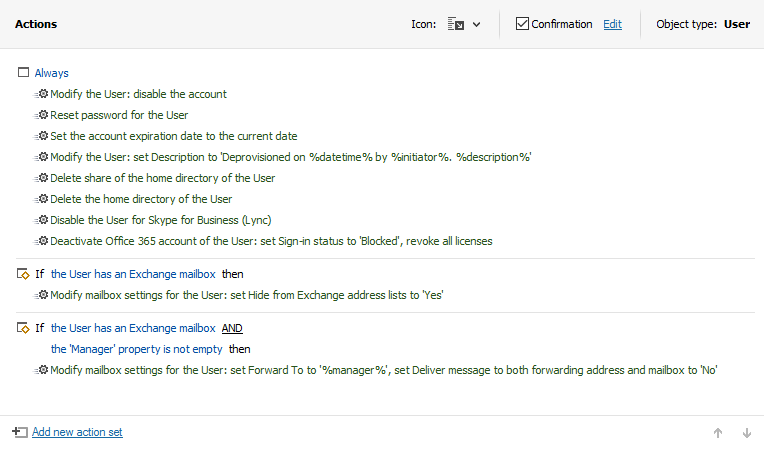 With Custom Commands you can combine any set of actions in a single task. This includes any amount of built-in actions or even your own custom scripts. As a result, custom commands can be operated just as any other task mentioned above. Thus they can be executed for multiple objects in one go. 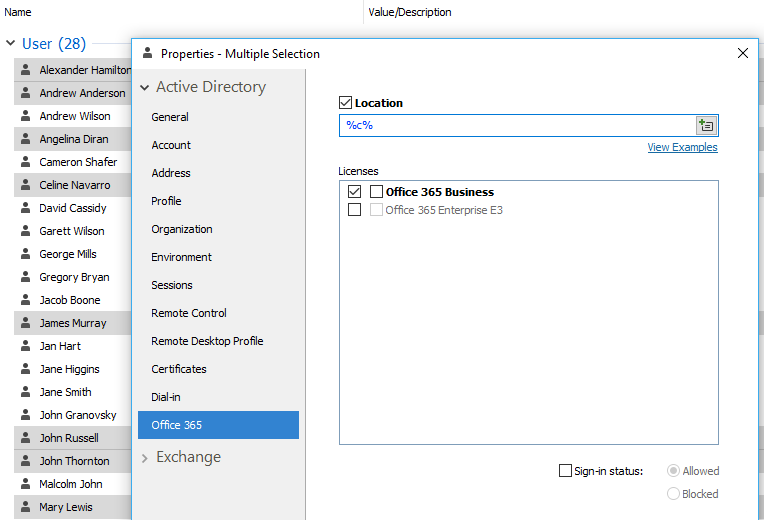 For example, a Deprovision custom command can include multiple steps, such as moving account to a specific OU, removing it from groups, relocation of home folders, changing account options, disabling users for Lync/Skype for Business, archiving Exchange mailbox, etc. But for end users all those actions will be represented by a single action that can be executed on a set of users. Using Custom Commands can also be a convenient way to execute your scripts for multiple AD objects. Practically it provides a UI that enables you to directly see the scope that you are applying your script to. The best thing about custom commands is that end-users who can perform those tasks don’t need to know anything about the complexity behind a custom command. For them it is same simple and smooth user experience: define scope, select objects, execute operation. No specific skills or training involved.